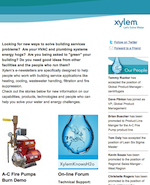 XylemKnowsH2o is the social media component of Xylem – Residential and Commercial Water. We are here to discuss the world’s water issues. With innovative systems in almost every area of water handling, control, treatment and distribution, Xylem is deeply involved in the cycle of water. Combatting America’s #1 Natural Hazard! For those of us who are sports fans or may have played a sport at one time in our lives, we’re familiar with the term, “coach them up.” In sports vernacular this speaks to the process of working closely with the athletes to teach them new plays and practice existing ones until they’ve perfected them. The “World Water Monitoring Challenge” Is On!